How Impeach-Obama Overpass Protests Started | Stop Obama Now!! Impeach Obama Protest in Carlsbad. The Impeach-Obama overpass protests started in southern California. These articles below provide background. The news of the protest went viral on the Internet. Several dozen blogs posted articles about the protest in Carlsbad, such as this one. 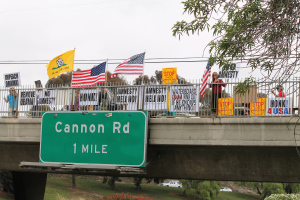 Inspired by the protest in Carlsbad on June 8, 2013, James Neighbors started Overpasses for Obama’s Impeachment in mid-June. This is a clip of the Carlsbad protest. The honk-storms put the lie to the mass media coverage and hesitant politicians. It demonstrated that there is massive support among ordinary Americans to impeach, convict and remove Obama from office.